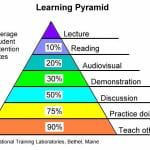 A lot of people believe that the “learning pyramid” that lists learning scenarios and average student retention rates is reliable. Here’s cognitive scientist Daniel Willingham to explain why it isn’t. Willingham is professor and director of graduate studies in psychology at the University of Virginia and author of “Why Don’t Students Like School?” His newly published book is “When Can You Trust The Experts? How to tell good science from bad in education.” This appeared on his Science and Education blog…. how was memory tested (percent recalled is almost always much higher for recognition tests than recall). what subjects know about the to-be-remembered material (if you already know something about the subject, memory will be much better. Lalley and Miller questioned the value of the “Learning Pyramid” in their 2007 Education article, The Learning Pyramid: Does It Point Teachers in the Right Direction? The Learning Pyramid: Does It Point Teachers in the Right Direction? Lalley, James P.; Miller, Robert H.
The criticism of the “Learning Pyramid” centers on the rigid assignment of teaching methods which correspond with a hierarchy that too rigid and static. The “Learning Pyramid” may be a beginning point for assessment, but is not the be all.